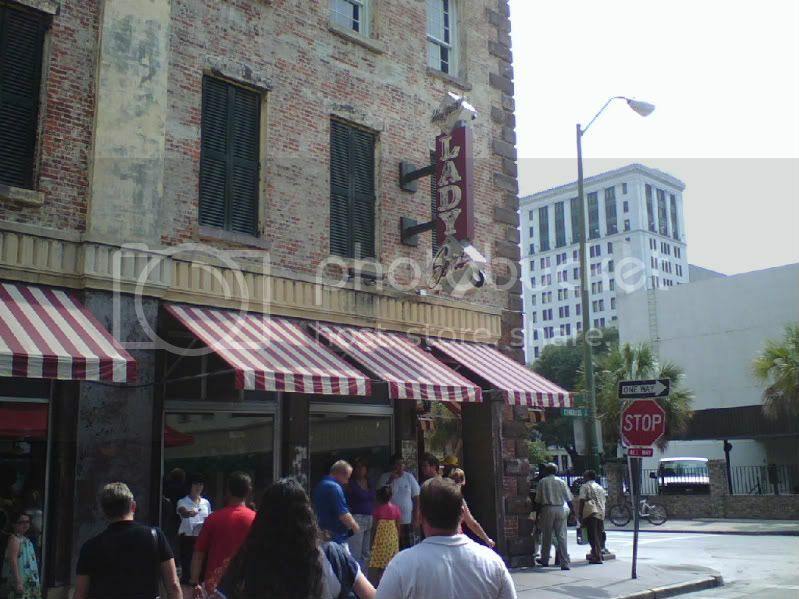 While in Savannah this weekend, we ate at Paula Deen's place. The Wife likes to watch the Food Network. And she's been wanting to go to Paula Deen's restaurant in Savannah. The Lady and Sons. She's the Food Network fan, not me. I like food, you see. A lot. But I don't want to watch it on TV. I want to eat it. The thing is, I just didn't "get" the whole Paula Deen thing. But I'm not "dissing" it or putting it down in any way. But to most people, she's a Food Network star. The Wife included. To me, she's the Bag Lady. I remember when she made a name for herself when she started up her business. Because I read the Savannah newspaper and watched Savannah TV when I lived over in that part of the state. For the first, on, 30-something years of my life. Anyway, suddenly, one day, Paula Deen was a TV star. And I'm happy that many people get to experience her food. Because her food is South Georgia cooking. And lots of folks don't get to experience it. And that struck home today. We were sitting in The Lady and Sons when the waitress brought us the biscuits and cornbread. And the couple at a table near us didn't know what it was. I had to listen to the waitress explain the biscuits and cornbread. They had never seen flat cornbread. Probably because they weren't from around there. Or anywhere near there. Which shows to a degree that I grew up eating food like you eat at Paula Deen's. The macaroni and cheese tasted a whole lot like the way a great-aunt made it. And the fried chicken a lot like another lady I knew used to make hers. In other words, it was good eatin' ... and like the eatin' I was used to coming up. The Wife was the one that wanted to go to Paula Deen's place to eat. But I think I enjoyed it more. Where's the photo of the veal cutlet? I want some veal cutlet! Thanks--I'm hungry for some good food now! she is an entire corperation..
Not really, but I am a big Paula Deen fan and very jealous!